John Shirley Ceramics: Time for Something New! 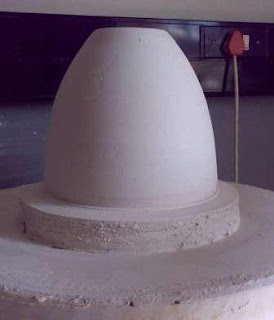 I haven't produced much work recently but have been busy with Plaster of Paris developing some new forms and moulds. The image above is one of the new forms. I am also developing a series of setters for my work. Until now I have used the subtle distortions created by the firing process as part of the uniqueness of each piece. I am now looking at a variety of setters to use in the kiln so that, if desired, I can keep the original shape during the firing. By the end of this month all the moulds should be complete and dry and the new pieces should make an appearance. john... just discovered your blog, love your work, i'm a big fan of the soluble salt work.